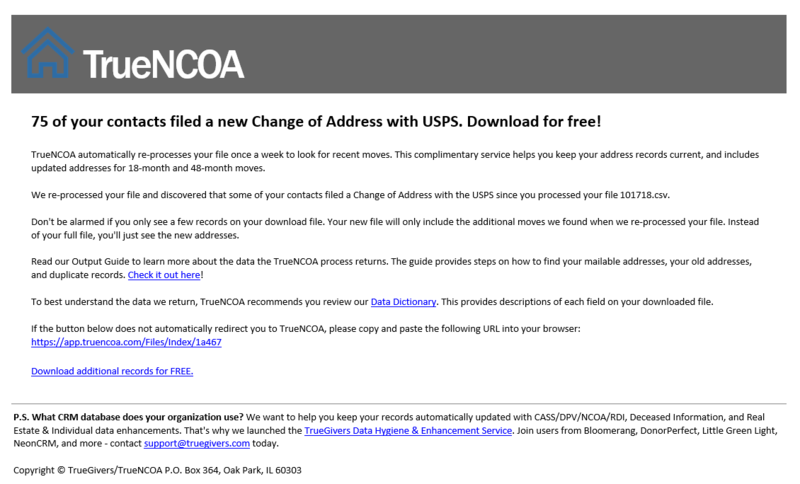 TrueNCOA automatically re-processes your NCOA updated file to look for recent moves. This complimentary service helps you keep your address records current. We re-process your file and identify any of your contacts that have filed a Change of Address with the USPS since your purchase. Login today to download these additional records for FREE. Don't be alarmed if you only see a few records on your download file. Your new file will only include the additional moves we found when we re-processed your file. Instead of your full file, you'll just see the new addresses. It would be a real bummer to process your file only to miss out on a change of address that's filed a few weeks (or days) afterwards. Our solution is here! We now automatically re-process your active file(s) every week. Active files are those that were first processed within the last 90 days. This free, complimentary service helps you get as many standardized and updated addresses as possible. This process runs your addresses with a record_type of either Active or Current through TrueNCOA to check for additional moves. When we find additional moves, we'll send you a notification email with a link to download them. This supplementary file will only have your new moves, so it will probably be just a few rows of data. It's free to download, and ready to use. We don't aggregate these results, so you'll have to download the results via the custom link in each alert email. 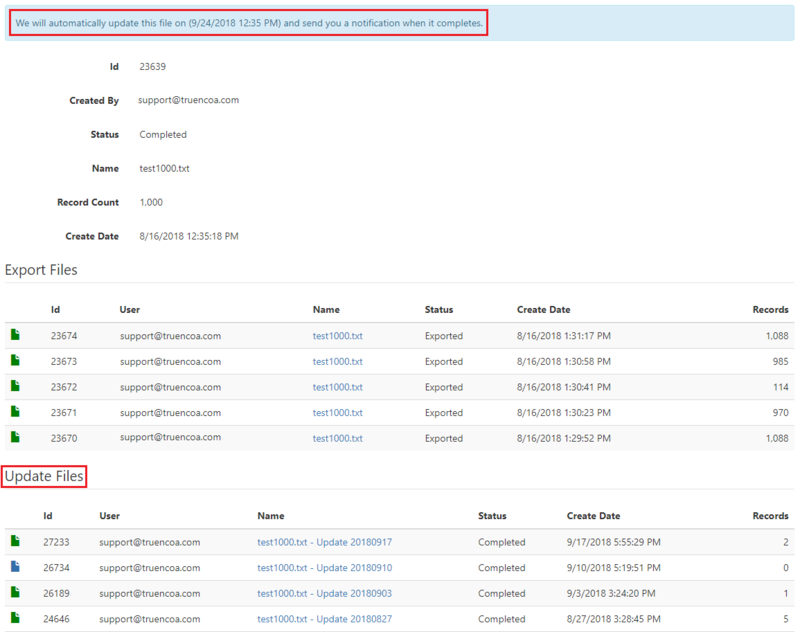 You may receive several notification emails during those 90 days, and you'll get the most out of the service if you download the results from each notification. Files processed through TrueNCOA expire after 90 days. We re-process your file as soon as it expires. The re-processed file is treated like a brand new file. When the re-process completes, you'll get a notification email inviting you to review the TrueNCOA Report. If you like what you see, export and download the file. You will be charged a credit to download this file. The download file includes all input data and all output data, rather than the limited data included in the Automated Active File Re-Processing. Read our Output Guide to learn more about the data the TrueNCOA process returns. The guide provides steps on how to find your mailable addresses, your old addresses, and duplicate records. To best understand the data we return, TrueNCOA recommends you review our Data Dictionary. This provides descriptions of each field on your downloaded file.